I've always found beef stew, as a whole, to be an unusual culinary creature. I don't think I've ever had it one particular way more than once. If I try to make its liquid base creamy, it turns out too soupy. If I try to thin the broth, it turns out too thick. Ahhh, the struggle! I also find the texture of a ground beef to be much more pleasing to my palate. While I am an omnivore that loves a nice chunk of meat every so often, I've always found eating traditional beef stew - avec chunks - to be a tad laborious to eat. The ground beef really is your friend here; it disperses throughout the stew, allowing for meat in virtually every bite you take. Of note, I did use baby kale in this recipe. In general, I've moved away from using baby spinach years ago in favor of this. 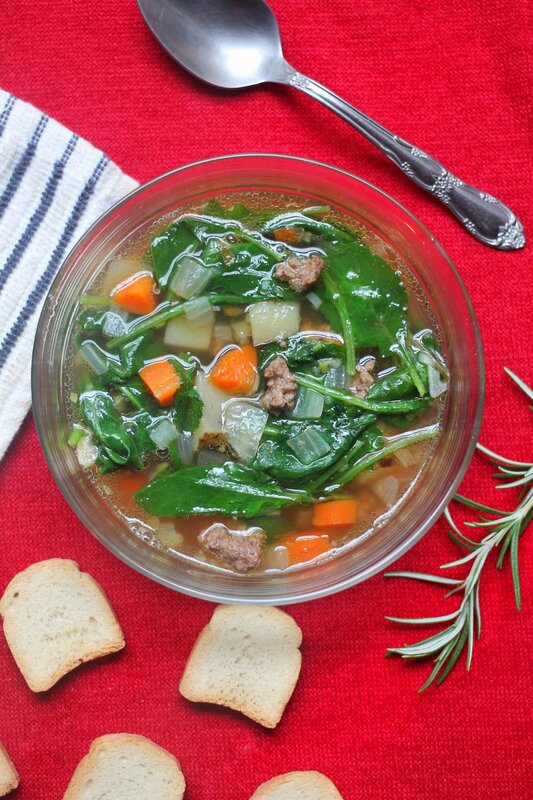 Though it wilts a bit like baby spinach, it holds its integrity a bit better and melds into this stew well. I do love adult kale, so to speak, haha, and it can surely be used in this recipe! I'll explain better how to incorporate it as this recipe progresses. It's still winter for a few more weeks! We better get our fill of stews while we still can! - 1 lb. grass-fed ground beef; I used a 85% lean / 15% fat mix, but you do you! - If using curly or lacinto kale as opposed to baby kale, see #2; clean leaves, remove kale from ribs, roughly chop, and add in to cook with the onions, carrots, and potatoes. 1.) In a large dutch oven or soup pot, brown ground beef on medium heat until cooked through; season will salt. Remove beef from pot and set aside; keep rendered beef fat in the pot but if you think there is too much, remove at your discretion. 2.) Add butter to pot and allow to melt into the beef fat, keeping heat at medium. Add the onion, carrots, and potatoes and cook over 10 - 15 minutes. Be careful not to allow onions to burn, but a little browning is fine; lower heat to medium-low if onions brown to fast. 3.) Add garlic, stir into mixture, and allow to cook for 1 minute before adding in broth. Add cooked ground beef back in. Place in sprig of rosemary, turn heat to medium-low, and allow to simmer for a half hour or until potatoes and carrots are soft. Remove sprig of rosemary, add in baby kale, and stir to combine. Allow to simmer for an additional five minutes. 5.) Add salt and pepper to taste; serve immediately, store in fridge for up to five days, or freeze for future use! I'd love to hear how it goes for you down in the comments section below - or if you have a variation you like, I'm all ears!